The 17-year-old Sandeep Lamichhane made history when he became the first cricketer from Nepal to get signed for an IPL team. 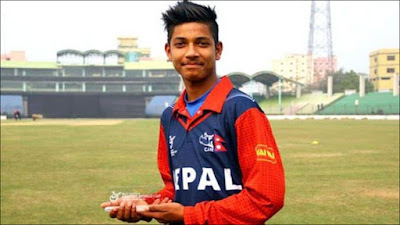 Sandeep Lamichhane was bought by Ricky Ponting's Delhi Daredevils in the ongoing players’ auction for his base price of Rs 20 lakh in Bangalore. The IPL auction was held on 27 and 28 January at Bangalore a day after the final of the Syed Mushtaq Ali Trophy. The 17-year-old leg-spinner first came into light at the U-19 World Cup in 2016 where he claimed a hat-trick and guided Nepal to a creditable eighth place. He hogged the limelight by becoming the second-highest wicket-taker in the tournament with 14 scalps in six innings at an average of 17 and an economy of 4.67. Sandeep's performance caught the attention of former Australian captain Michael Clarke, who picked the teenager to play alongside him for Kowloon Cantoons in the Hong Kong T20 Blitz. Later Sandeep was invited by Michael Clarke to play for his team Western Suburbs in the NSW Premier Cricket season in Australia. His performance also earned him praise from former Aussie great Shane Warne. Sandeep Lamichhane was not originally part of the long-list of 1122 players who had entered the IPL auction. He was, however, later included among the 578 players. The 2018 season of the Indian Premier League, also known as IPL 11 will be the eleventh season of the IPL. The Indian Premier League is a professional Twenty20 cricket league which was established by the BCCI in 2008. IPL 11 will be held from 7th April to 27th May and it will witness the return of the Chennai Super Kings and the Rajasthan Royals after serving two years of suspension for the involvement of their respective owners in the 2013 IPL betting case. Star Sports has bagged the media rights at Rs 16,347.5 crore ($2.55 billion) for five years starting from 2018. Eight teams are scheduled to play in 2018. The 10th season of the Indian Premier League was won by Mumbai Indians.